Use coupon code “Sewingreport” for 10% off your first box! After filming this video, I have started making the orange peel blocks! They are not difficult and I am loving the consistency provided by the freezer paper templates. I’d seen this pattern/method before and had been curious to try it. 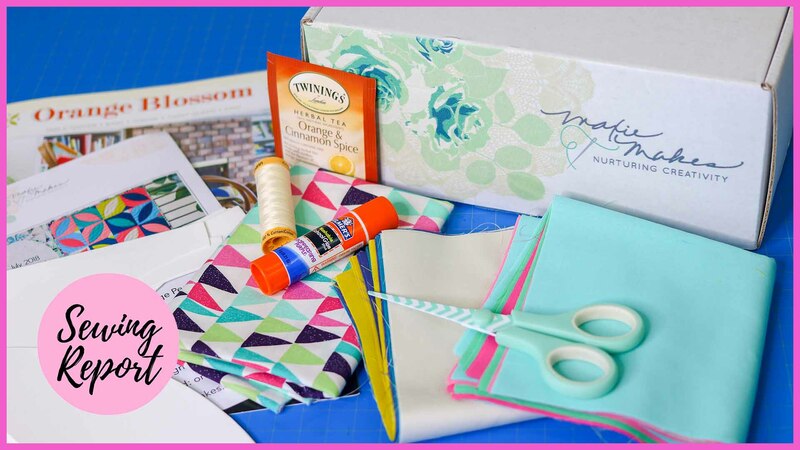 Maxie Mail is a subscription box for sewists that comes right to your door every month, filled to the brim with inspiration that will include fabrics, patterns, new ideas and tools to help you be successful in your sewing room. But perhaps most importantly, my motivation for this box is to help you build your skill set so that you are able to take on any project your heart can dream up! There will even be something personal tucked inside, just to celebrate YOU! This box was sent to me complimentary from Maxie, but I’ve become a big fan over the past several months and highly recommend them for the fabric and project selection.